Recipe: White cardstock from PTI, fiskars cloud punch, Martha Stewart Felt heart, I-rock heart bling, Congrats stamp from PTI, Martha Stewart Balloon punch, Twine. A stroll through little tokyo unveils a stamp heaven! So to give these little stamps the love and attention they deserve I used the cuttlebug tags and clear cardstock! 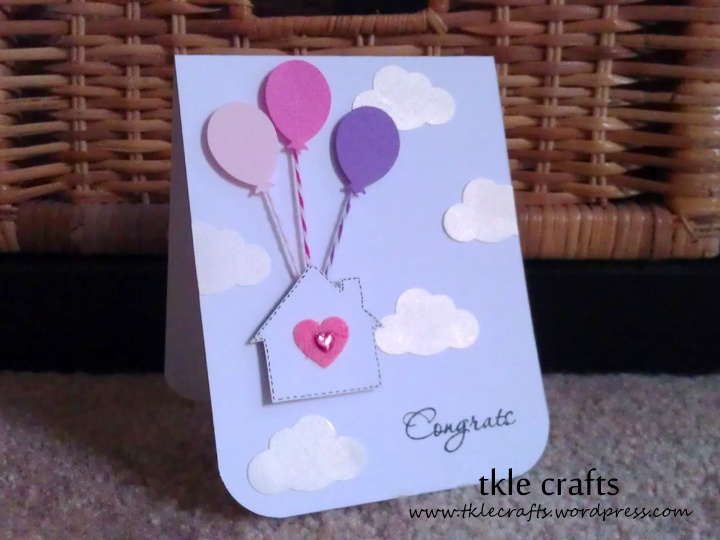 The tags were attached to the white cardstock using colorful brads. 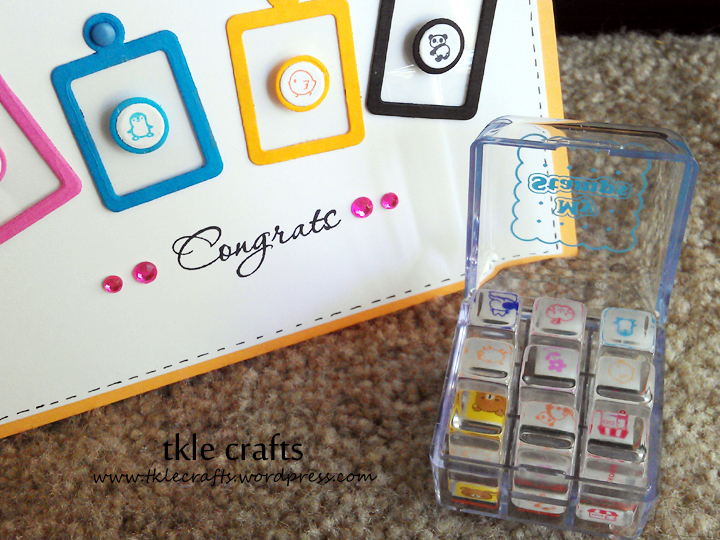 There were over twenty different little stamps to choose from and a cute little case to keep them in! I love this set! 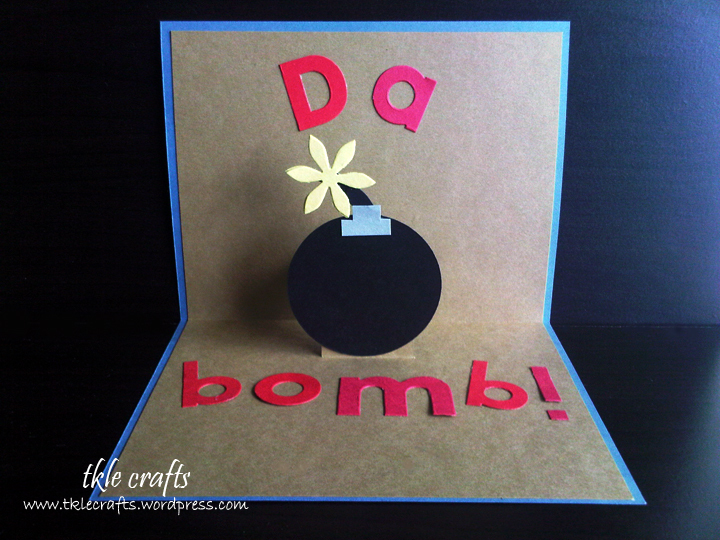 Recipe: Cardstock from PTI, Japanese stamps, black pen, brads from Recollections, Cuttlebug tags, Stampin’ Up Ink Spots, PTI Congrats Stamp, Bling. Babies love to hang out! I love this stamp set! It’s called Hanging Out! 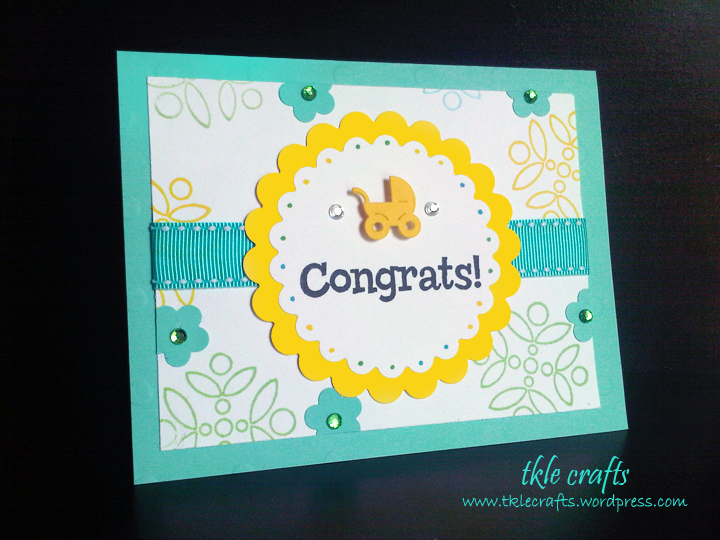 Here’s the first of many more baby cards to come! I can’t wait because I have so many family and friends to send baby cards too! I will need to make a few baby shower cards and I think this is the perfect set for it! 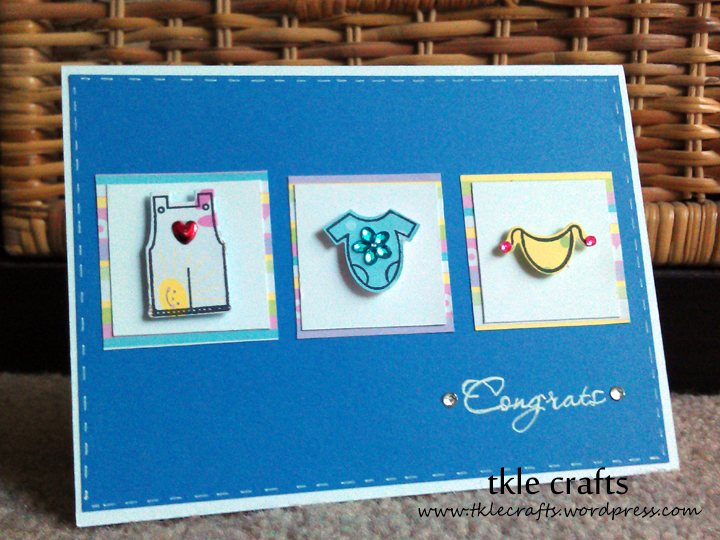 Recipe: Cardstock from PTI, White Gel Pen, Baby Scrapbook paper, PTI Hanging out stamp set, imaginiscne bling, PTI Congrats Stamp. So I finally purchased my first set of Spellbinders Nestabilties and I think they are so fantastic! They are so much better than the Sizzix die cuts (well the ones that look like a little black brick!) because they are very easy to store and I can use it to cut little windows on my cards. My set had six different sizes of scalloped circles which is great for layering so I am officially obsessed! Helpful Tips: Store your spellbinders in a clear plastic cd case because the packaging it comes in is a bit flimsy! This will save you a lot of storage space and if you are like me, you can store it next to your cd cases with all the clear stamps! Recipe: All craftstock from Recollections, Flower stamp from Hampton Art, Ribbon/bling from Michaels, Flower punch from Ek Success, Baby carriage die cut from Cuttle bug, Memento Tuxedo Black Ink, Gable green/Glorious green/Yo Yo Yellow ink from Stampin’ Up Bold Brights, Congrats Stamp from the Paper Company. Recipe: All craftstock from Recollections, Cuttlebug Alphabet Red Tag Sale dies, Cuttlebug Olivia Alphabet dies.